This handmade, 100% real pressed flower and foliage round porcelain ornament featuring blue hydrangea makes an everlasting keepsake or special gift. One-of-a-kind, what you see is what you get. Flowers are protected and mounted on designer paper. Ornament comes with gold tone stretch chord for hanging and is approx. 2 5/8" diameter overall with a 1 3/4" diameter design area. Comes with or without acrylic stand. 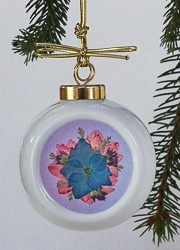 Includes information slip about what makes this ornament so special with featured flower/s noted on the back by Em. Note: available in quantity of one. Comes in a gift box.